On March 27, San Francisco Ballet opened its fifth program of the 2019 season. “Lyric Voices” contains a total of three ballets, each as stunning as the last. The segments emphasize different themes and radiate unique atmospheres, yet their combination is fantastic. Sporting minimalistic set design and magnificent lighting throughout, “Lyric Voices” takes the audience on trips to outer space, the glowing world of technology and a geometric interpretation of opera. The first act, “Your Flesh Shall Be a Great Poem,” captures dynamism within delicacy exceptionally. In order to accentuate the essence of the characters onstage and their anatomy, the stage is stripped completely bare. The dramatic use of lighting (James F. Ingalls) heightens the audience’s senses and effectively focuses all attention on the dancers. It is clear that fluidity of the body and graceful movements (as choreographed by Trey McIntyre) are of utmost importance in this set — even as the dancers jump, their landings are breathtakingly silent. This overwhelming quiet actually accentuates the few times when the dancers intentionally fall hard, making it impactful. Their glides are silky smooth, and the way their flesh seems to meld together at times is impossible to ignore. 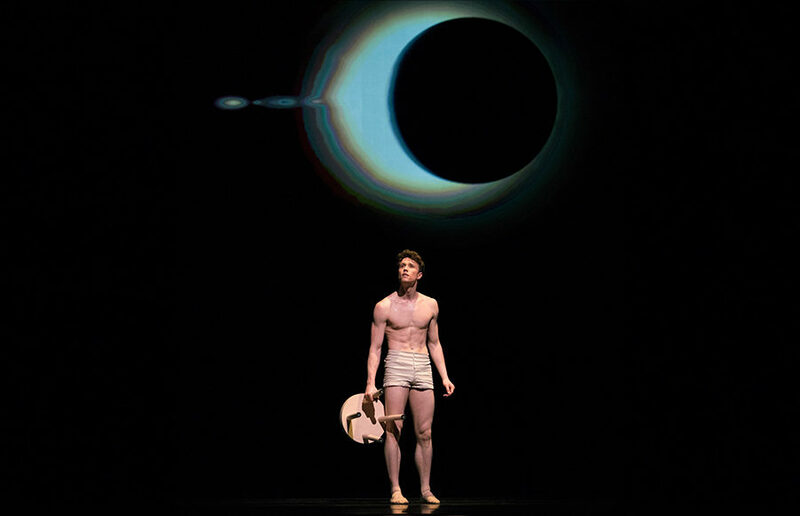 During soloist Benjamin Freemantle’s performance in “Your Flesh Shall Be a Great Poem,” dark spherical planets and solar eclipses are projected onto the backdrop, intensifying the sense of solitude in a vast world. 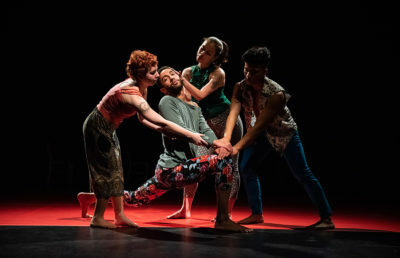 Accompanying Freemantle on the stage is a short step stool; rather than dancing with a partner, Freemantle incorporates this unconventional prop into his dancing, highlighting his loneliness. It is rather impressive that such a stiff object — one that is notorious for making loud screeches when pulled across hard floors — glides effortlessly along his skin and spins on the stage without a noise. Midway through intermission, the stage curtain rises to reveal a screen. Gradually, random letters and symbols — including the Apple logo — start to accumulate on this screen, filling it to the brim with blinking flashes of green. By the time the second act begins, the stage looks like a screening of “The Matrix.” The title, “Bound To,” flickers in the middle, and the dancers’ faces appear in the exaggerated light of their smartphones. As the dancers twitch with the music like they are computer glitches, blue letters trickle down in a transparent sheen in front of them. At the same time, the act does not forget to incite laughter. At one point, principal dancer Yuan Yuan Tan crosses the stage, not looking up from her phone until another dancer snatches it away pointedly, causing the audience to chuckle at her surprised expression. While “Bound To” is a contemporary imagining of ballet, an art form dating back to the 15th century, “…two united in a single soul…” contains music and choreography that are more traditional. The set is entirely made up of geometric shapes, such as sharp-angled stairs and a large silver sphere. This sphere is later creatively utilized to reflect a skull that is projected onto the stage floor during a solo performance. The dancers often line up in a row and execute a waterfall of the same movement, a marvelous sequence to witness. The costumes (Christopher Read) stress bright blues and rich purples that match flawlessly with the dreamy glow of the set. Opera by 17th-century Baroque composer George Frideric Handel is also utilized to stress the piece’s classical orientation. San Francisco Ballet has once again presented a truly magical evening full of dynamic movement and delicate details. The themes explored in “Lyric Voices” such as loneliness, connection and unity are extremely relevant in today’s rapidly evolving society. Manifesting these difficult and mature themes into a refined and abstract art form proves the expertise and prowess of SF Ballet and its many artists. “Lyric Voices” will be running at San Francisco Ballet through April 7.